life and explore the far reaches of the cosmos. The GravityBowl is unlike any other vehicle you've ever been in. Its omni-directional, meaning that is has no front or back. It can move in any direction and smoothly transition between directions. It can spin in place. It can spin while moving in a straight line. Its computer-controlled micro-controllers allow for complex waltz-like pre-programmed movement sequences. 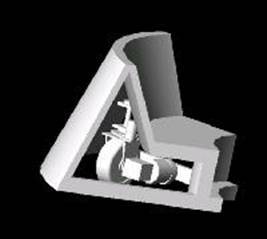 When you see the GravityBowl you will know that it is a vehicle designed for space exploration. It is a large saucer shaped vehicle. 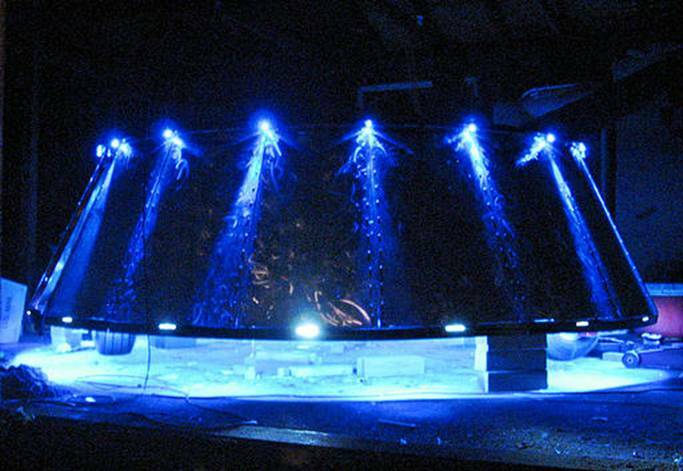 Its sleek outer surface is composed of highly polished aluminum with embedded LEDs that display programmed light sequences. The undercarriage contains colored fluorescent lights, creating a halo of light from beneath. The onboard sound system plays sound effects corresponding to vehicle movement. As you explore the Milky Way and the vast spaces beyond; do not worry, you are not alone. The journey is as much an inward one as outward. As you learn about the universe and meet denizens of other worlds you will learn their culture and find travel companions. 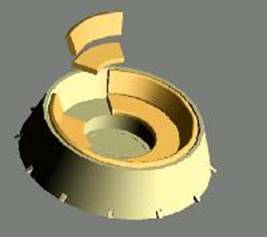 While the GravityBowl travels outward, the interior of the GravityBowl has circular seating that faces inward. As the GravityBowl travels from planet to planet, picking up and dropping off creatures from other worlds, they will sit comfortably facing each other during their journey encouraging passengers to explore inward, to get to know each other and to understand the different communities inhabiting our galaxy. Exploration is as much about interacting with each other as it is interacting with the cosmos. The GravityBowl is powered by three wheels, each driven by two electric motors. Because it is electrically powered, passengers don't have to cope with the noise and fumes associated with gas-powered vehicles. Its nine rechargeable batteries are powered by generators back at its home camp with roughly three hours of drive time between charges. There are 10 microprocessors on board - three in each wheel controller and one central unit coordinating the motions. They all communicate using an RS485 serial link. This car is driven using three e-tek motors for about 6 hp of continuous power. The maximum loaded weight will be about 1300kg and we should be able to go from 0-10mph in around 3 seconds with a top speed of around 15mph. The drive system is designed to deliver smooth low-speed control with manual overrides. Back-up mechanical steering is possible in the event of complete electronic failure. The GravityBowl is designed for safely. It is a very brightly lit, slow moving vehicle. The vehicle sits very low to the ground (on 6-8 inches from the Playa's surface) making it neigh-impossible to run over anything. Only designated drivers that have been trained and practiced with the vehicle’s control system will be allowed to drive the GravityBowl. This consists of only a small set of individuals (five) all of whom feel strongly about sobriety while driving. 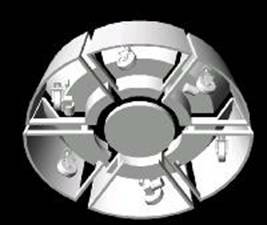 The initial concept of the GravityBowl was formed during BurningMan 2003. One of the treasured things about BurningMan is the opportunity it provides to bond with strangers from all walks of life, economic backgrounds and geographical homes. In the past the designers found themselves torn between going out and exploring the amazing artwork of Black Rock City and spending intimate time in a chill space bonding with new friends. GravityBowl was designed to allow citizens to do both – travel the city and while at the same time having an inwardly focused interactive experience with others. During Burning Man the vehicle will be taken out frequently with the goal of picking up random strangers - preferably one individual at a time to encourage strangers to meet. Participants will be instructed the purpose of the vehicle is to explore the inhabitants of the cosmos and encouraged to interact and get to know one another. This may involve driving out to the far out reaches of space (a quiet piece of distant playa) and parking for a while to sit and chat. The more people we can introduce the better.